Have you ever wondered what the most desirable seats on the subway are? Or why kids always find them? 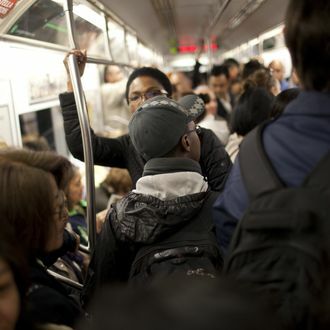 Now there’s a 7,602-word study, “Observed Customer Seating and Standing Behaviors and Seat Preferences Onboard Subway Cars in New York City,” dedicated to examining every piece of sociological minutiae. (The Times says, “The snapshots combine to sketch a transit landscape of convenience, game theory and occasional altruism, where often every movement is executed with purpose.”) And have you ever wondered how much money all those people acting bizarrely around you make? Conveniently, The New Yorker has all the data, by subway line and stop, in a beautiful, interactive infographic. Now you know.